Could Puerto Rico really become the 51st U.S. state? In addition to the defeat of Puerto Rico’s budget-cutting governor Luis Fortuño in yesterday’s gubernatorial election, Puerto Ricans have also voted in a two-question referendum in opposition to its current commonwealth status, marking the worst result for the status quo in four such referenda in half a century. That doesn’t mean Puerto Rico is exactly on the fast track to become the 51st state of the United States. There are reasons to believe that the path to statehood would encounter obstacles both from U.S. legislators in Washington, D.C. as well as difficulties in San Juan — not least of which due to the fact that Puerto Rico’s newly elected governor, Alejandro García Padilla, opposes Puerto Rican statehood and is likely to prioritize creating jobs and reducing crime over constitutional status issues. The island is currently a U.S. territory, and since 1952, its constitutional status has been as a ‘commonwealth’ of the United States. More on that below. First, let’s examine the actual referendum and the result. The referendum itself was a complex two-question vote. Puerto Ricans were first asked whether the commonwealth should continue to have its present form of territorial status. 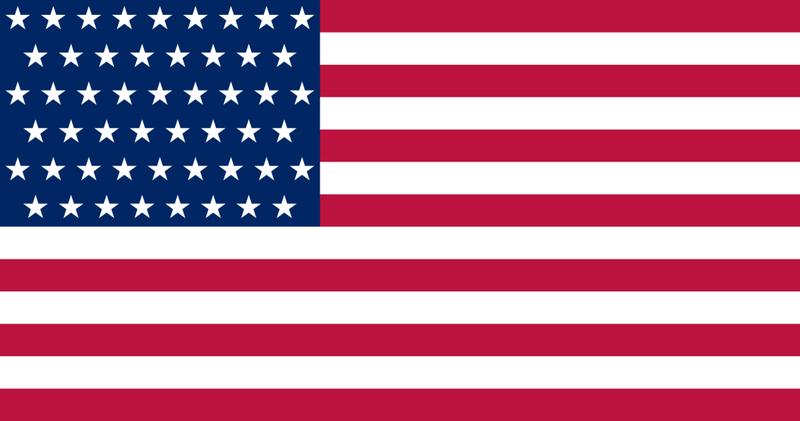 Puerto Ricans were also asked which non-territorial option they prefer among three options: becoming a U.S. state, becoming independent, or becoming a ‘free associated state’ — think of the latter option as ‘independence light‘ akin to the relationship that Palau and the Marshall Islands have to the United States or like the relationship the Cook Islands have with New Zealand. Puerto Ricans could vote on the second question regardless of their position on the first question, so voters who support the current commonwealth status could nonetheless vote for their preferred non-commonwealth status as well. Around 1.82 million voters participated in the referendum. On the first question, 53.99% of voters voted that Puerto Rico should not continue to have its present form of territorial status, and 46.01% supported the current status. In four referenda since 1967, that’s clearly the strongest vote against Puerto Rico’s commonwealth status. On the second question, though, the headline statistic that most U.S. media are reporting is that 61.15% of Puerto Rican voters supported statehood (with 33.31% supporting a ‘free associated state’ and just 5.53% supporting full independence). But that overstates the case, because over 486,000 voters cast either invalid or blank votes on the second question. When you take those into consideration, statehood won just 44.62% of total votes, blank and invalid votes ‘won’ 27.04%, the ‘free associated state’ option won 24.31%, and full independence won 4.04%. So while statehood seems to be the preferred alternative, not even a majority of the voters who took part in the referendum actually cast a vote for statehood. Furthermore, we don’t know how ‘yes’ and ‘no’ voters actually voted on the second question, so there’s no way to know, what the anti-commonwealth voters, as a group, actually prefer. Accordingly, the result isn’t a clear victory for much of anything, let alone statehood. That may be fine — it’s just a non-binding referendum anyway. As noted above, García Padilla and his Partido Popular Democrático de Puerto Rico (the PPD, Popular Democratic Party of Puerto Rico) is opposed to statehood, so it seems less likely that Puerto Rico will aggressively pursue statehood than if the incumbent, Luis Fortuño of the pro-statehood Partido Nuevo Progresista de Puerto Rico (the PNP, New Progressive Party of Puerto Rico) had won reelection. Notably, however, Puerto Rico’s ‘resident commissioner,’ its non-voting representative to the U.S. House of Representatives, has the chief responsibility of introducing legislation to admit Puerto Rico as the 51st state. Puerto Rico’s resident commissioner, Pedro Pierluisi — who was only narrowly reelected on Tuesday with a 1% margin — belongs to the pro-statehood PNP. Pierluisi, indeed, has indicated that he favors introducing such legislation. We’ll find out, I guess. Proponents of statehood chafe at the idea that Puerto Rico is somehow less equal, that it’s a colonial remnant from the imperial era. Other supporters believe that full statehood would help lift Puerto Rico’s economic status by creating more links to the mainstream U.S. economy — the island’s GDP per capita of just $24,000 is almost half of GDP per capita on the mainland, the island has been stuck in a recession for the past six years and poverty, crime and unemployment are much higher there than on the mainland. Opponents argue that statehood would not deliver many more benefits than Puerto Ricans currently enjoy, while subjecting it to less autonomy and more responsibility for U.S. federal taxes. Furthermore, opponents worry that statehood could endanger the unique ‘boricua’ culture of the predominantly Spanish-speaking territory. Needless to say, if you’ve ever been to San Juan, you realize quickly that it’s a world away from even heavily Latino U.S. cities like Miami, Los Angeles or New York. 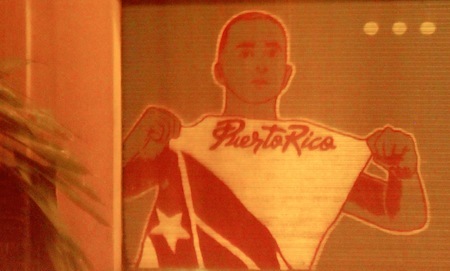 Nonetheless, Puerto Ricans are already well assimilated into U.S. culture and life — indeed, there are more mainland citizens of Puerto Rican descent in United States than on the island, and Puerto Ricans on the U.S. mainland share a rich cultural heritage, especially within the ‘Nuyorican’ diaspora that emerged in New York in the 20th century. Since 1952, independence has remained a fairly unpopular option, although if Puerto Rico were a sovereign nation, it would be the Caribbean’s fourth most-populous country, after Cuba, Haiti and the Dominican Republic. Its $96.26 billion economy would become the largest economy in the Caribbean, dwarfing not just the Cuban ($60.8 billion) or Dominican ($55.6 billion) economies, but also Central American ones, such as Panamá’s ($30.7 billion) and Costa Rica’s ($41.0 billion). 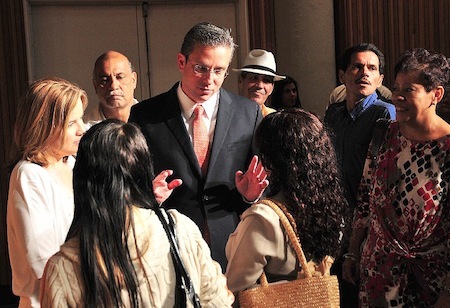 Alejandro García Padilla (pictured above), a Puerto Rican senator, narrowly defeated Puerto Rico’s governor Luis Fortuño in Tuesday’s Puerto Rican gubernatorial election and Fortuño conceded the race earlier this afternoon — with over 96% of the votes counted, García Padilla leads with 47.85% to just 47.04% for Fortuño. Who is Luis Fortuño? A primer on Puerto Rico and the Republican Party’s favorite boricua. Tonight, at the U.S. Republican National Convention in Tampa, Florida, the list of primetime speakers will feature the governor of the Commonwealth of Puerto Rico, Luis Fortuño. Although Suffragio doesn’t normally wade into U.S. politics, Puerto Rican politics lies fairly far afield from mainstream American politics, notwithstanding the plum role that Fortuño will fill tonight at the convention in his support for U.S. presidential candidate Mitt Romney. 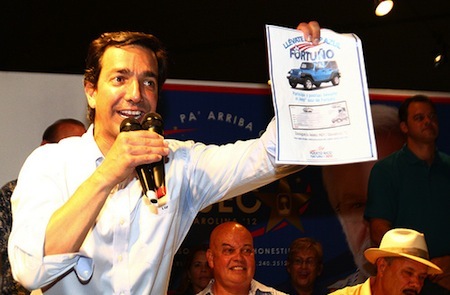 Fortuño was elected governor of Puerto Rico in 2009, winning 52.8% of the vote to just 41.3% for the incumbent, Aníbal Acevedo Vilá, who had been implicated in a corruption scandal. As governor, Fortuño immediately embarked upon a relatively unpopular program of cutting $2 billion from Puerto Rico’s budget, resulting in over 12,000 layoffs of state employees. Fortuño also passed and implemented Law 154, which imposed a temporary excise tax on certain overseas sales, while also cutting taxes 50% for individuals and 30% for businesses. Ultimately, Fortuño brought the budget deficit from $2 billion in 2009-10 to just $333 million in 2012-13 — his zeal for cutting budgets and for lowering taxes has attracted a significant amount of regard from Republicans on the U.S. mainland, and he was even mentioned as a potential vice presidential candidate for Romney. Political parties in Puerto Rico, however, aren’t organized along the same ideological lines as on the U.S. mainland — Fortuño belongs to the Partido Nuevo Progresista de Puerto Rico (the PNP, New Progressive Party of Puerto Rico), which is first and foremost a proponent of full statehood for Puerto Rico. In contrast, the Partido Popular Democrático de Puerto Rico (the PPD, Popular Democratic Party of Puerto Rico) favors Puerto Rico’s current status as a commonwealth. 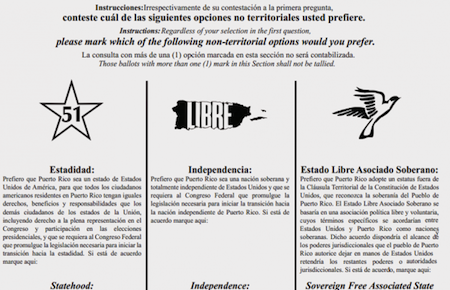 A smaller third party, Partido Independentista Puertorriqueño (Puerto Rico Independence Party) favors Puerto Rico’s full independence — it looks and feels much like a traditional Latin American populist/leftist party, and it has attracted the support of the likes of high-profile Latin American figures, including author Gabriel García Márquez.